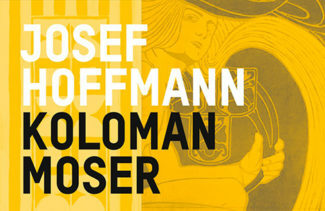 The exhibition studies the relationship of Josef Hoffmann and one of the protagonists of the 2018 celebrations – Koloman Moser. Koloman Moser, »a multi-faceted multi-creator«, as Ludwig Hevesi called him during an exhibition discussion in 1900, cannot be approached in the same way as Josef Hoffmann in terms of his art. Both share an unbridled creative drive and fantasy, manifested in thousands of sketches. But while Hoffmann always remains a tectonically strict designer, Koloman Moser represents an idyllically decorative element in all of his projects. He is the artistic antipode to the design practice of Josef Hoffmann, focusing on architecture and shaped by schooling under Otto Wagner. With Moser, figurative work continues to remain a theme; the illustrative element is obvious even in the most severe designs. As one of the artists of the art renovation in Vienna around 1900 he decidedly contributed to the diffusion of art in the Secession style and in applied graphics. The exhibition is a confrontation of the designs by both protagonists of the “Wiener Werkstätte”.